In our 5-day AutoCAD Bootcamp, participants get in depth training on the industry standard tools for engineering and building professionals. This class is really the best way to fully emerge into AutoCAD. From starting the software and understanding the user interface to architectural, engineering and construction (AEC) projects, participants will get in-depth hands on practice and walk away ready to work and capable of creating full designs. While AutoCAD and AutoCAD LT for Macintosh users are welcome to attend this class and will learn skills and techniques that apply to both Macintosh and Windows versions of AutoCAD, public classes are typically taught only on Windows computers and the course manual and training files are designed specifically for the Windows operating system. AutoCAD for Mac software includes most of the functionality of the Windows version of AutoCAD, but with a specialized Mac interface and feature set. Mac users may want to view this comparison of AutoCAD for Windows and AutoCAD for Mac prior to registering for this class. Schedule of upcoming AutoCAD Bootcamp training classes. By focusing on hands on practice, you will learn to create and edit professional AutoCAD drawings. Learn how to navigate AutoCAD toolbars and menus and how to use the command prompt, to apply basic drawing skills, use drawing aids (such as object snap, ortho and polar tracking and grids), edit entities, work with curves, control object visibility and appearance, and gain fundamental AutoCAD skills. The instructor provides time-saving tips and describes techniques for creating primarily two-dimensional drawings. Recommended by Autodesk for all new users to AutoCAD including those pursuing AutoCAD certification. This official Autodesk authorized 5-day AutoCAD training class is designed for anyone new to the AutoCAD platform or for those with a moderate amount of experience seeking a more structured and comprehensive understanding of the AutoCAD software platform and a solid foundation in best practices, techniques and workflows. ‘It is appropriate for those using either AutoCAD or AutoCAD LT, as well as new users who will be using more specialized editions of AutoCAD such as AutoCAD Architecture, AutoCAD Civil 3D, AutoCAD Electrical, AutoCAD Map 3D, and AutoCAD Mechanical. The core AutoCAD concepts covered are considered a prerequisite for the more advanced tools available in these more specialized AutoCAD-based software products. This class is appropriate for novice users of AutoCAD, AutoCAD LT, and most other AutoCAD products. No previous CAD experience necessary. You should have a working knowledge of the Windows operating system. Drafting, design or engineering experience a plus but not a requirement. We also suggest that you have access to AutoCAD software outside of class for practice. Autodesk gives students, educators, and educational institutions free access to AutoCAD for non-commercial purposes. Commercial users can obtain a free 30-day trial version of AutoCAD. 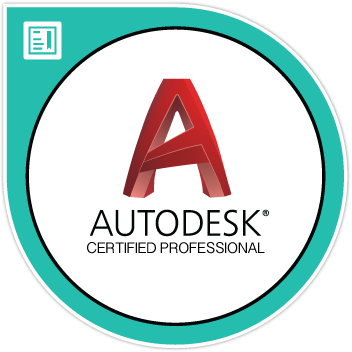 The Autodesk AutoCAD Certified Professional badge validates professional users knowledge of the tools, features, and common tasks of AutoCAD. Earners of this badge have demonstrated knowledge of dimensioning, basic drawing skills, using hatching and gradients, and more using AutoCAD. This class is a discounted combination of the AutoCAD Essentials and Intermediate AutoCAD classes. We typically schedule our AutoCAD Essentials and Intermediate AutoCAD classes in the same week so we offer this discount on the bundle of classes. Please view AutoCAD Essentials and Intermediate AutoCAD classes for topics covered. For student cancellation purposes, each separate component is treated as a separate class.